11 - 12 June 2003 N28�'2.7"
(152 m) Bardia is said to be the best wildlife park of the whole subcontinent. And it is said that the pre-monsoon weeks are the best time to see tigers. But we say those pre-monsoon weeks are just bloody hot. Too bloody hot . 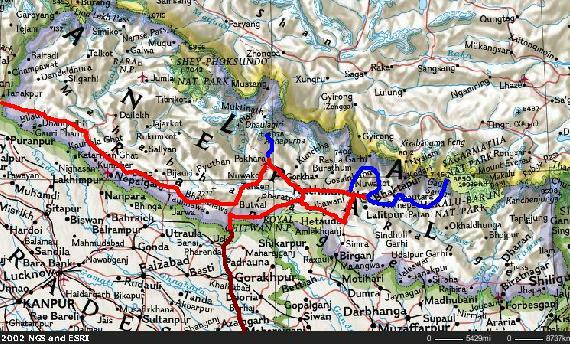 After one day rest we continued West to India. Opdracht 7 - 30.000 km gereden. 3 - 9 June 2003 N29�'54.7"
(802 m) Pokhara has a nice campsite next to the lake. A perfect place to spent our last days in Nepal before we have to run from the monsoon rains. (1313 m) Our final day in KTM, just to pick up the Indian visa. (1936 m) "... and from thence went on to Venice, where Nicolo Polo found that his wife, whom he had left with child at his departure, was dead, after having delivered of a son, who received the name of Marco, and was now of the age of nineteen years." On May 31st we are travelling for just one year. Nevertheless, it feels like ages since we left Utrecht. 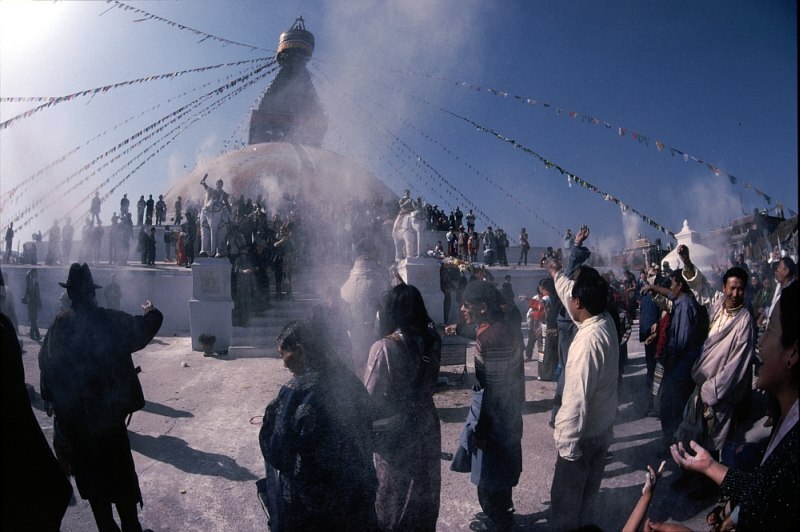 17 - 29 May 2003 N27�'48.5"
(1313 m) Back in KTM again for doing business: extension of our Nepali visa, extension of our Carnet de Passage, obtaining the visa for India and Pakistan, and not arranging a trip to Lhasa... :-( The Chinese border is closed because of SARS! Opdracht 4 - SARS gooit roet in de Peking Eend. Opdracht 24 - Vrijwilligerswerk in Nepal. Opdracht 29 - Tijgers en Geitjes. 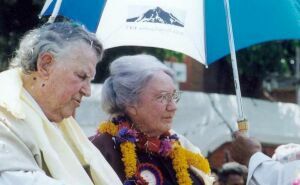 And we are in KTM, of course, to see Edmund Hillary on the Everest 50th Anniversery celebration! 9 - 16 May 2003 N27�'11.4"
Dutch: Reisverslag van de Everest trek. 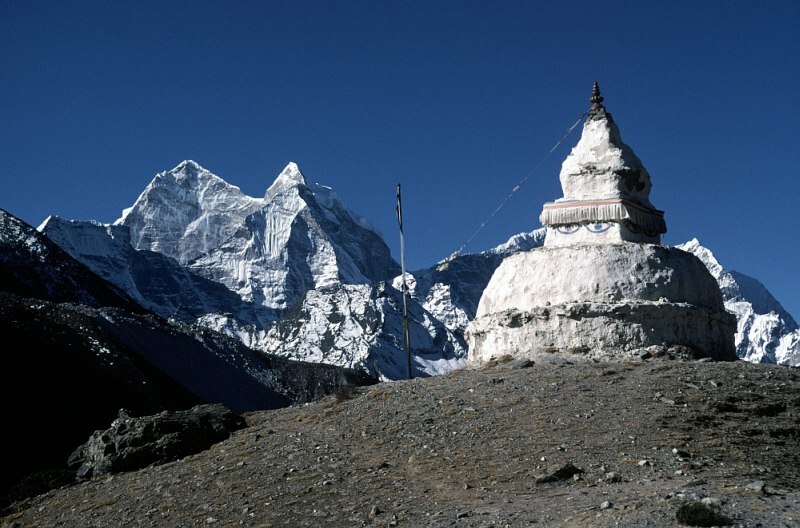 6 - 8 May 2003 N27�'15.8"
(3443 m) The main village in the Everest area. 7 days walking from the nearest road (Jiri), 10 hours walking from the nearest airstrip (Lukla), but that's not a reason not to have 3 German Bakeries and 3 internetcafes in town! Of course, this is still Nepal, so making some pavement on the muddy streets is out of the question. Sherpa's: rode mutsen, gele mutsen. Opdracht 26 - Teambuildingstraining voor Namche Bazaar. 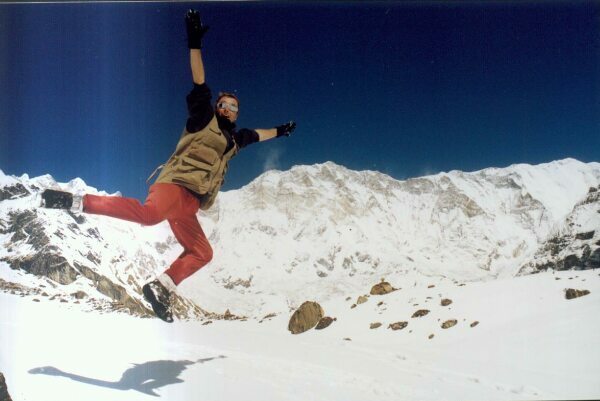 1 - 5 May 2003 N27�'21.0"
(6000 m) Climbing a so called "Trekking Peak" has nothing to do with trekking, but everything with ice-climbing. The climb is very tough and very cold: I got mild frostbite on four vingers due to taking pictures. The reward, however, is big. At 6000 meters and just 10 km from Mt Everest the view is unbelievable! 23 - 30 April 2003 N27�'14.1"
(4779 m) Gokyo is arguably the most beautiful place of the Everest area (Sagarmatha National Park). 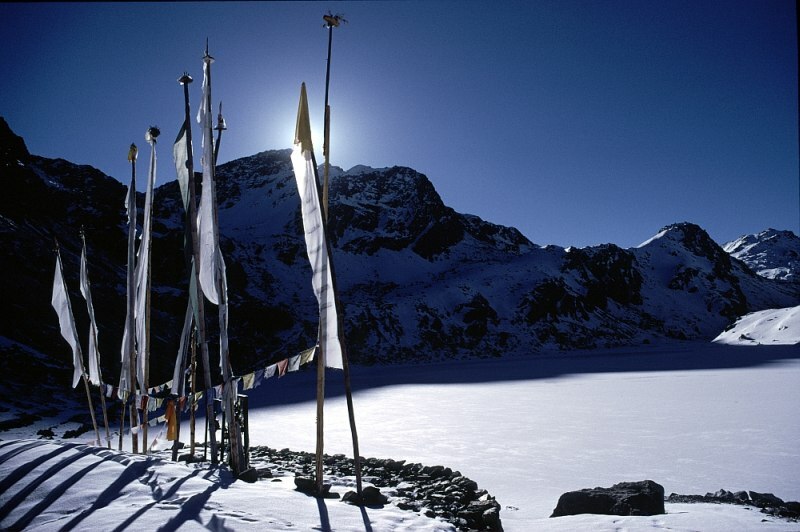 The view from Gokyo Ri, a hill of 5366 m, is superb with four 8000 meter peaks visible from short distance. To reach Gokyo from the Everest Basecamp, we crossed the tricky but spectacular Cho La pass: walking over a glacier at 5370 meters. 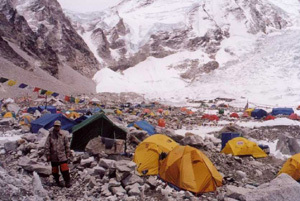 16 - 22 April 2003 N28�25.1"
(5340 m) 27 expeditions to Everest, 6 expeditions to neighbouring Lhotse: the 50th anniversery of the climbing of Everest makes Everest Basecamp an absurdly crowded place. With the GPS we measured a size of 500 meters for the basecamp - bigger than most European campings! The Mt Everest news site. 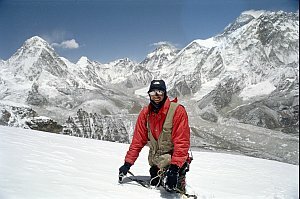 Team Everest 03 - with one arm to the summit! The May 2003 Issue of National Geographic Magazine. Opdracht 1 - Zand van EBC, c.q. 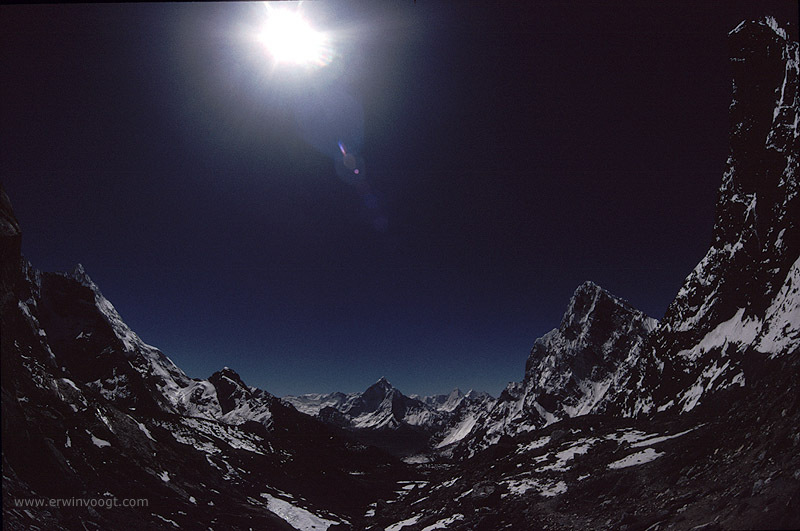 de Khumbu Glacier. Opdracht 19 - Interview met een yak... eh... nak. (2857 m) Uh... mountains are not airports... but Lukla is both! The airstrip goes upwards on the mountain, making landing (going up) or departing (going down) a nice rollercoaster attraction. 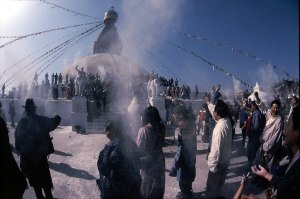 9 - 14 April 2003 N27�'48.5"
April 14th is New Year's Day for the Nepalis, who use a slightly different calender than we do. Dutch: Reisverslag van de Gosainkund trek. Back again in the capital to arrange the trip to Lhasa and the climbing of the Lobuche peak. Opdracht 6 - TATA dinky-toy gevonden in Kathmandu! (807 m) After two weeks of noodles and macaroni decent, but also bacteria-rich food again. And, not really a suprise, the second Gulf-war had started which resulted in the rationing of diesel in Nepal. Therefore we had to shop around to collect enough diesel for the way back to Kathmandu. (4130 m) The trek to Annapurna Basecamp (ABC) is one of the few treks in Nepal where you can reach a high altitude area in a just a few days. In March there can be still a lot of snow en route, as we experienced. Dutch: Reisverslag van de Annapurna trek. Opdracht 2 - Maanverlichte Annapurna's. Opdracht 3 - Volleyballen in de sneeuw. Opdracht 10 - Alternatieve skisprong. Opdracht 18 - ABC: Teigetje was here. 7 - 9 March 2003 N28�'42.2"
(807 m) Pokhara is the starting point for treks to and around the Annapurna mountains. With our parents we prepared for the trek to the Annapurna Basecamp. 1 - 7 March 2003 N27�'48.5"
(1313 m) On March 2nd both our parents arrived for a visit. We are probably the only "tour group" in KTM now, although the current talks between the Maoists and the central government give some hope of peace for the Nepalis and a return of tourists(income). Opdracht 23 - Het GPK Guest House is niet meer. Opdracht 28 - De papies en mamies komen op bezoek. (1313 m) With Western goodies and LandCruisers available again, our first days in KTM meant doing business for us. Info: The packing and advice list is expanded again. (98 m) Sunauli, or Sonauli as it is called by the Indians, is a small village with a ramshackle gate in the center of town: this is the border between India and Nepal. Even with a vehicle it takes only an hour to get through the customs and to obtain a visa for Nepal. Dutch: In een uurtje de grens over.